Embrace HVAC efficiency and reliability by choosing a geothermal system, which can provide operating efficiency that’s superior to traditional air source heat pump systems in several ways. Let’s take a look at what a geothermal system is and how it can benefit you. What Are Geothermal HVAC Systems? While it may get cold above ground during the winter, underground temperatures stay the same. A geothermal HVAC system from Tuckey Mechanical Services takes heat from the ground and distributes it around your home. In the summer, it can also circulate the air in a building to convert it into cooler air. Geothermal systems have similar components to other HVAC systems, but they are often a more efficient option. At Tuckey, we sell a wide range of HVAC equipment from leading brands such as ClimateMaster and Bryant. Let us help you find an energy-efficient solution for your home. Cost Savings: While they generally cost more up front, geothermal systems are highly efficient and can result in high savings as opposed to fossil fuel options over the long term. With the elimination of fuel comes a reduction in costs associated with transportation, purchasing and cleanup. Quiet Operation: As opposed to noisy outdoor units that may cause issues with both peaceful sleep and neighbors, geothermal systems make about as much noise as refrigerators or freezers during operation — that is, not much at all. Enhanced Comfort: No other option can beat geothermal systems when it comes to heating and cooling. These systems eliminate hot and cold blasts of air that have come to be associated with the function of traditional systems. In addition, they dehumidify the air during summer months that are hot and muggy, increasing the comfort levels of everyone inside the home. Eco-Friendliness: Geothermal systems are environmentally friendly in that they transfer heat to and from the earth, which means they don’t rely on fossil fuels to operate. 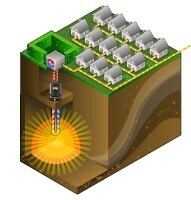 Geothermal energy is renewable, which helps reduce pollution. You may already have a geothermal system in place, or perhaps you’re wondering what might happen if you get one installed and then it requires maintenance or repairs. Worry no longer, as you can trust Tuckey Mechanical Services to take care of any needs or problems that arise. We work with ClimateMaster and Bryant geothermal systems, as well as equipment from other leading manufacturers, respond quickly to repair needs, and offer 24/7 emergency service to make sure you’re kept comfortable at all times. If you’re a homeowner looking for ways to conserve energy and protect your family while saving money, be sure to call us at (717) 249-3733 today! We serve customers in South Central Pennsylvania areas such as Carlisle, Harrisburg, Perry County, and Chambersburg. Ready to improve your home’s HVAC capability and keep your systems running smoothly for years to come? If so, reach out to us today. "What an absolute awesome Company and incredibly awesome employee...Dave was competent in his work, proactive in all efforts, and went out of his way to effect repairs on one of the coldest days of the year. He keep us informed every step of the way. We honestly felt like he was a member of the family. No one compares to him...he is a great representative to truly an outstanding company!!"